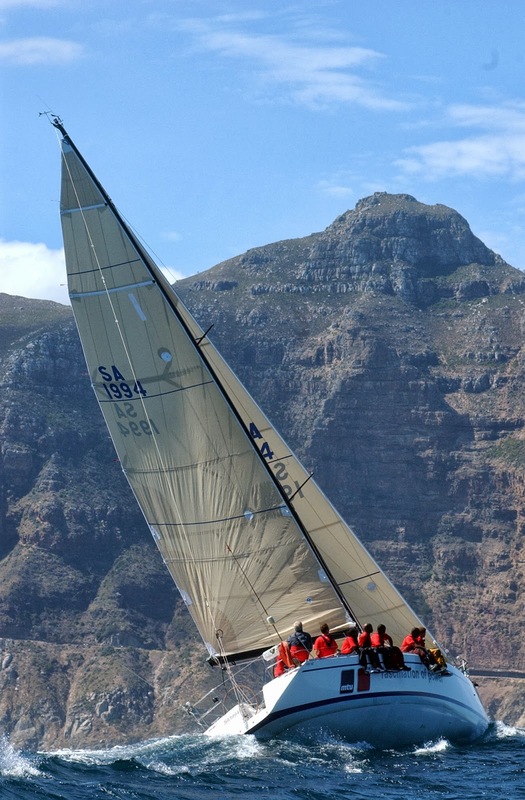 Reviews of popular yachts in South African waters. These are all good boats in their own way. SA Navy Entry "MTU Fascination of Power" under Chapman's Peak in Hout Bay. Skipper was John Martin, Admirals Regatta about 2006. Designer Simonis-Voogd - they have done loads of work in SA and reside here quite a lot. Their stable is well known - including the famous "Broomstick", "Nicorette" and many others. That's a pretty light boat at 42'. Note the ballast ratio is 36% - thanks to a very deep keel bulb. 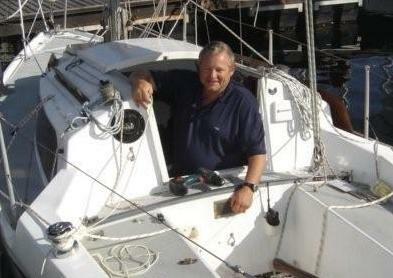 They are high-aspect boats in every sense - keel, rudder and huge rig. Yet they are as sensitive as dinghies as long as they keep moving. From the outside - the impression is thoroughbred racer. The sleek lines, neat cabin top, dual wheels, large racing cockpit, wide traveller etc all look the business, and one might be forgiven for expecting a bare-bones racing interior. Well laid out and spacious cockpit. Not exactly sheltered but great for sailing! 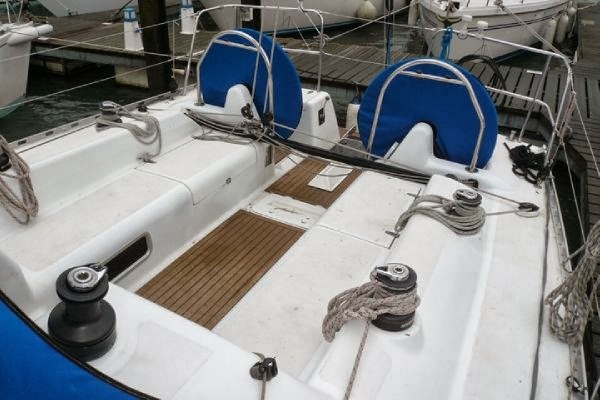 Double-handing is easy, but single-handing is a bit tricky because the helmsman can't reach the traveller or mainsheet from behind the wheel, unless autopilot is engaged. Fitting, quality and layout do vary somewhat from model to model. The very early ones were built by Robertson and Caine in Cape Town, before production rights were taken over by Fast Yachts in Durban, where the majority were subsequently built. I am aware of some controversy over one or two builds, but the majority are quite sound. 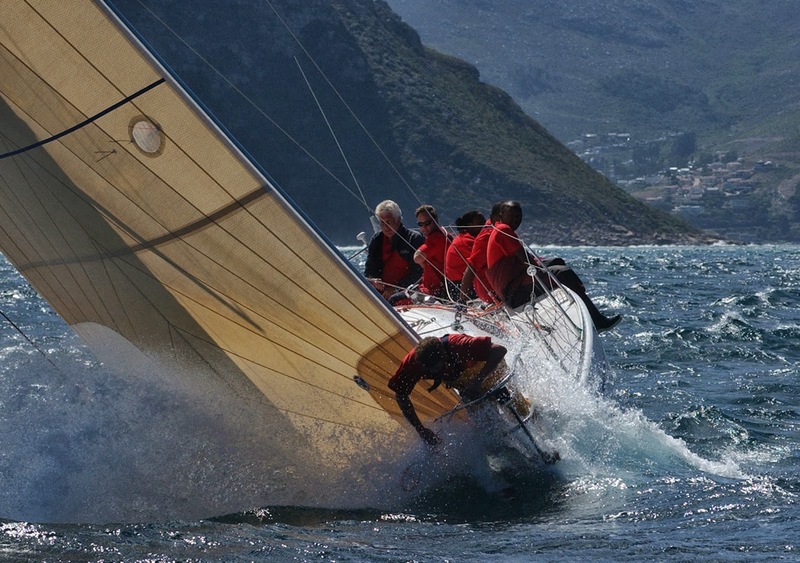 Skebanga, in Hout Bay, was one of the the last off the line as I remember, and she is particularly well put together and in great condition. Can't imagine what this poor bloke on the bow was up to. One Wednesday evening the wind was too strong for racing in our bay - 35 kts +. We were just settled in the club bar when the hooligans went out - James and Rian - sorry chaps - the names just slipped out! - plus a few unsuspecting crew who should have known better. They fought their way up to Chappies, complete with wild katabatic twisters and plenty of spray, and then turned around. Next thing the bag went up! Crikey - the boat zig-zagged on its ear for about 30s before regaining some sort of composure, and then shot off towards the club at about 20 knots. As luck would have it, I had a camcorder with a decent zoom on hand - will see if I can dig it up soon and place it on youtube. What a spectacle. That's the kind of boat a Fast-42 is - wild as the wind and still quite manageable, but also a civilised boat when the occasion demands! All in all - they are best suited for offshore racing. Certainly not what I would chose as a cruiser, but a good choice for Cape-Rio or Governors Cup! You can have a load of fun with one of these.